Hallie and Chris are newlyweds…and are as sweet as can be. We had such a fun time with them…even though our visit was short. They are so full of life and energy! I initially met Hallie when she sent me this photo and told me the cool “God story” about her wedding dress. It was a thrift store find…perfect size…perfect price! And look at her fabulous hair! It matched the flowers in their wedding…now that just makes me HAPPY! A few weeks later, she offered to trade their Champion Juicer when we passed through Tampa, and of course, I was quite excited about that! We had been wanting a Champion…so that was such a blessing! When we arrived from Sarasota…we met Hallie at their church and we got settled back into a nice, quiet corner. The church had a HUGE lot with a playground, so it was a blessing to have our very own “front yard” with room to run and play and be free. That evening, we went to their apartment to have supper (a HUGE yummy salad with all the fixins!). 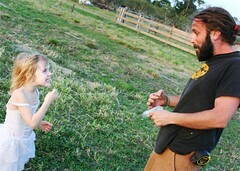 Bella loved watching their turtles and geckos…and we had a great time chatting. Both Hallie and Chris work from home…in the comic book/art industry. We had fun looking at the different comics they have done! 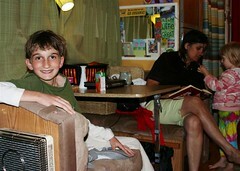 The next day, we met for lunch at The Grass Root, an organic vegan/vegetarian/raw restaurant. From the moment we walked in, I knew it would be a wonderful experience! It’s so deliciously earthy in there…with a deep orange color on all the walls that just radiates warmth! The owner, Spencer, was our server…and his wife, Sabrina, was on hand as well. The food was AMAZING…so flavorful, with options for everyone. 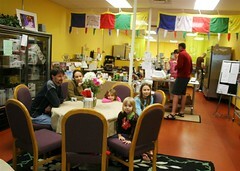 They do more than just raw food, and have an extensive menu for the entire family. 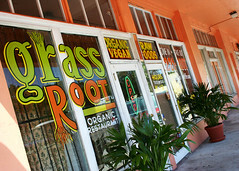 Grass Root is not only a destination for the health conscious, but also a cultural hub in Tampa. We have customers from all walks of life. Our restaurant has provided us with the opportunity to connect and feed a large array of people. We feel blessed to be of service to all of you. Grass Root is truly an expression of who we are as people and collectively as a family. We have great respect for the Earth itself and accept responsibility for its well being. We know that eating an organic vegetarian diet is a major contribution. For those striving for an optimum existence , the RAW/LIVING foods lifestyle is the way to go. It has profoundly positive effects on your overall health, the environment and those around you. They have won several awards, including one from VegNews for being one of the best restaurants for “every day dining” in the entire country! They also have a large raw meetup each month. I am so happy that we found this little gem…I really, really wanted to go back for another meal…but we had to leave for Atlanta! Someday…I’ll be back and will enjoy their food once again. If you’re ever in Tampa, don’t miss it. Thanks to Hallie and Chris for being such great hosts! We drove straight across the state of Florida … from Vero Beach to Sarasota, and arrived at Paul and Nicole’s house. Some of you may know Nicole as “Mrs. Pivec” of Golightly Place. 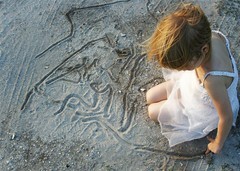 When we arrived, we were greeted warmly with a chalk drawn “Welcome Friends” in the driveway. An entire crew of people answered the door when I rang the doorbell, and we got to meet everyone, including Paul’s brother’s family, who was down visiting from Minneapolis for a month. That night we had a delicious meal…Nicole is a wonderful chef, and their family is vegetarian. We sat out on their back patio and enjoyed the fragrant orange blossoms as the smells wafted through the night air. We had big plans to go to the beach the next day…but when we woke up, it was raining. And the forecast said that there would be more “soaking” rain. We didn’t want to take the chance, so we had a day of thrifting and grocery store shopping. Before we headed out though, I got to use their VitaMix to make my green smoothie…weeeee! Love it. Later on, we made some magic carrot juice…oooooh the carrot juice! 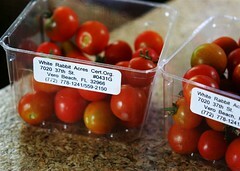 Speaking of food, we also went to Veggie Magic (owned by Jenna Norwood of Supercharge Me!). It’s a new raw restaurant in Tampa and we were excited to go! 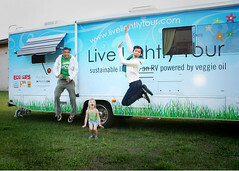 We had a great time taking it all in…checking out all the raw goodies. One of my favorite things was the caramelized onion “bread”…but later on we found out that it didn’t really agree with our digestive systems hee hee. We had “living” pizza, a Mexican green wrap, curried cauliflower, and raw apple crisp. Delish! On Easter Sunday, we enjoyed visiting their house church (which they just happen to live right next door to! )…and a crazy egg hunt in the backyard. Paul and Nicole’s home backs up to a small pond…which they assured us only has one small alligator…sometimes There are other exotic birds (or so it seems to us) and lots of lizards too. They have an orange tree, grapefruit tree, mango tree, and avocado tree! It was like the Garden of Eden! I’ve never had an orange straight off the tree and it was like juicy heaven. 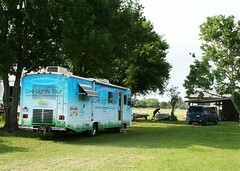 It was such a beautiful setting…perfect for celebrating the resurrection of King Jesus! After all that excitement, we had a potluck brunch, and then at the last minute decided to head to the beach! I am sooooo glad we did. It was a GORGEOUS day at Siesta Key, which was just a short drive from their house. We were able to get a lot of sun, build several sand castles and get in a few boogie boarding runs by Bella. It’s just so relaxing being at the beach. It’s not something I’m familiar with…growing up in Iowa. I could lay there all day reading and listening to the sound of the waves. As we were leaving, we were able to see a drumming circle starting. Yet another thing that I could listen to all day! I love drums. We arrived home sandy and tired…but it was so worth it! Bella really enjoyed playing with the “big girls”, whom she lovingly called “Friend” because she could never remember their names (i.e. “Hey FRIEND!! Where ARE YOU??!). They spent a lot of time on the swings and the trampoline. More swinging practice for Bella. 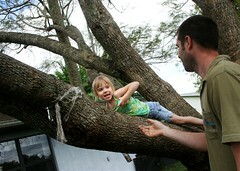 I think we might have to figure out how to attach a swing to the RV! Thank you to the Pivec Family for opening your home and hearts to us! Our Florida visit was wonderful! Kevin, Lori, Justin, and Josie are old friends of ours from Minnesota. 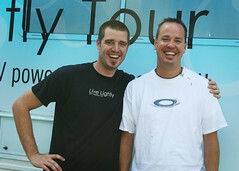 Kevin was the youth pastor at Matt’s church in Brainerd, and now is the youth pastor at a church there in Florida. They were only the 2nd family that we’ve stayed with on the tour that we’ve known them in real life (not just online) before we arrived! It was a super quick stop…just an overnight stay, but we were able to catch up, show them the rig, spread some green/raw food love, and then hit the road again. We loved the huge palm trees in front of their house and all the crazy lizards and birds that reside in their backyard! Thanks for the hospitality guys…it was so fun to see you!